A bird's egg is a nearly perfect survival capsule--an external womb--and one of natural selection’s most wonderful creations. Shortlisted for the Royal Society Insight Investment Science Book Prize 2016.One of Forbes' Best Books About Birds and Birding in 2016. Renowned ornithologist Tim Birkhead opens this gripping story as a female guillemot chick hatches, already carrying her full quota of tiny eggs within her undeveloped ovary. As she grows into adulthood, only a few of her eggs mature, are released into the oviduct, and are fertilized by sperm stored from copulation that took place days or weeks earlier. Within a matter of hours, the fragile yolk is surrounded by albumen and the whole is gradually encased within a turquoise jewel of a shell. Soon the fully formed egg is expelled onto a rocky ledge, where it will be incubated for four weeks before a chick emerges and the life cycle begins again. THE MOST PERFECT THING is about how eggs in general are made, fertilized, developed, and hatched. 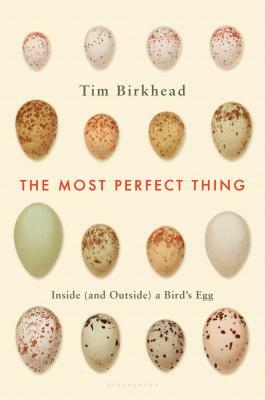 Birkhead uses birds' eggs as wondrous portals into natural history, enlivened by the stories of naturalists and scientists, including Birkhead and his students, whose discoveries have advanced current scientific knowledge of reproduction. Tim Birkhead is a professor at the University of Sheffield where he teaches animal behaviour and the history of science. He is a Fellow of the Royal Society of London and his research has taken him all over the world in the quest to understand the lives of birds. He has written for The Independent, New Scientist, BBC Wildlife. Among his other books are Promiscuity, Great Auk Islands, The Cambridge Encyclopaedia of Birds which won the McColvin medal and The Red Canary which won the Consul Cremer Prize. He is married with three children and lives in Sheffield.